Twist drill is a cutting tool comprised of cutting point at tip of a shaft with helical cutting edge. The various elements of twisting drills are described below. Body: It is the main parts of the tool, it extend from the drill shank to the tip of tool. Shank: It is the cylindrical portion of the drill that held in holding device. The shank may be straight or tapered. Hex shank drill bits are also available. The parallel shanks are provided in small tool bits. It is held in the machine by chucks. The larger size drills are provided tapered shank. It carries a tang at the end of the shank to ensure proper grip between the drill bit and driving machine. Tang: It is the flattened end of the tapered shank, which fit into the driving slot in a socket. It ensures the positive drive from the drill spindle. Margin: The part of the body which do not cut away. This narrow extension through the entire body provides clearance between drill and work material. A double margin drill bit have two margin instead of one. Dead center or chisel edge: It is the point where two cutting edge meets at the extreme tip. It should always be lie in the axis of twist drill. 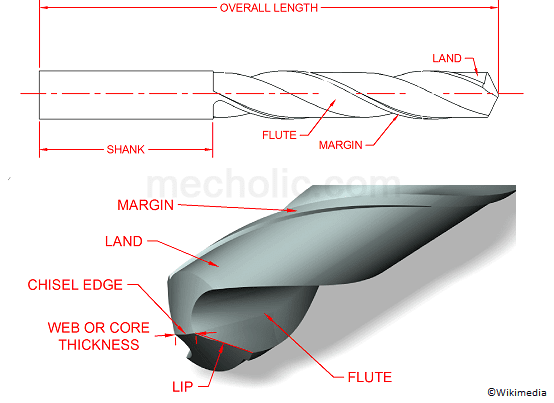 Flutes: It is the grooves in twist drill, which provides lip or cutting edge. Flank: surface of drill, which extends behind the lip to the flute. Lip: It is the cutting edge formed at the intersection of flank and flute. According to the tip of drill bit it may classified in to Split point drill bit, Pilot point drill bit and Brad point drill bits. To drill a hole of same depth and diameter twist drill required less power when compared to the other type of drills. Tool life is good; one twist drill can be used for a long time without frequent regrinding. Excessive heating may change the property tool material. Re-tempering of the drill without special facilities is not satisfactory. What are the Functions of flute of twist drill? Flute provide the passage for coolant/ cutting oils. The form the cutting edge and provide rake angle.